A year later, we have the sequel to the popular young adult novel series ‘The Maze Runner‘ with ‘The Scorch Trials‘. in my previous discussion about the first film, first time director Wes Ball certainly knew how to film and construct some excellent action sequences that were highly suspenseful and kept the adrenaline flowing like vicious rapids. That being said, the first film had its issues with pacing and dialogue, which is the same problem with the sequel. However, Ball has more or less switched genres on us with this sequel and made this more of a straight horror movie than anything else. ‘The Scorch Trials‘ is an intense ride from start to finish as we pick up where the last film left off with Thomas (Dylan O’Brien), Newt (Thomas Brodie Sanger), Minho (Ki Hong Lee), and Teresa (Kaya Scodelario), being picked up by a military team and brought to a safe haven (or so it seems) where they meet other kids their age. However, something isn’t right here as Aris (Jacob Lofland) talls Thomas this place has a sinister motive and that they need to escape. Sure enough, some diabolical things are happening here as Thomas and his crew along with some newcomers manage to escape into the “Scorch”, which is desert wasteland of what was once Earth. This is where things go full on horror mode in the vein of ‘28 Days Later‘. We finally get to see what W.C.K.D. (or as the kids pronounce as “wicked”) has up their sleeves and their ultimate plan is. From here, Thomas and his friends come across gangsters, infected zombies, and resistance fighters to try and destroy W.C.K.D., which is still led by Ava (Patricia Clarkson) and her right hand man Janson (Aidan Gillen). Not only do Thomas and his friends have to escape from the evil forces of W.C.K.D., but they have to avoid these infected people who are a mashup between the zombies in ‘28 Days Later‘ and the infected in ‘I Am Legend‘. If Ball knows how to do anything well, it’s a chase and escape action sequence, which luckily, this film has several segments of. Each one of these scenes is terrifying, thrilling, and scary as hell. I found myself on the edge of my seat and not breathing regularly during these sequences. It’s that much fun. Not only that, but it seems like some fun movie stars wanted to get in on the ‘Maze Runner‘ action with some great cameos, including Giancarlo Esposito, Lili Taylor, Barry Pepper, and Alan Tudyk to name a few. Running at over two hours, this film could have been trimmed down just a tiny bit, however there is enough thrilling action to keep your attention during the longer than needed run time. 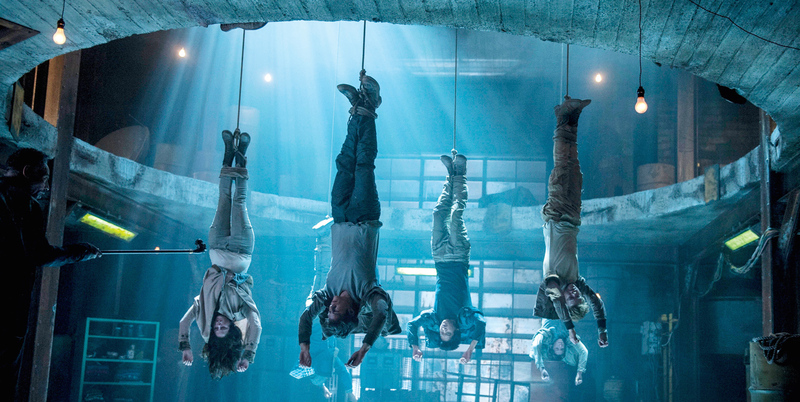 Despite a few pacing problems here and there with some less than desired dialogue, ‘The Scorch Trials‘ was insanely fun and with it’s signature twist towards the end, as well as a big set up for the third and final film (thank the gods they are not splitting the final movie into two segments), I’m definitely looking forward to the third movie. I’m curious to see if the Blu-ray version will have a rated ‘R’ version of the film, because there are some moments here where things get truly horrific. This is how you do a young adult adaptation. This entry was posted on Wednesday, September 16th, 2015 at 11:23 am	and is filed under Film, News. You can follow any responses to this entry through the RSS 2.0 feed. You can skip to the end and leave a response. Pinging is currently not allowed. « Film Review: ‘Pawn Sacrifice’! !